Clothing/Jewelry Description Shabby navy blue knickers, a gray middy blouse, black stockings and black shoes. Distinguishing Characteristics Caucasian male. Brown hair, blue eyes. William had a thin build at the time of his disappearance, and he has a pale complexion. He has a scar on his lower lip and a birthmark on his abdomen. His nickname is Billy and most agencies refer to him by that name. William was last seen in the hallway outside of his Brooklyn, New York City, New York apartment on February 11, 1927. He was playing with two neighbor boys, a three-year-old and a twelve-year-old. The older boy went inside his apartment and when he returned, both William and the three-year-old were gone. The three-year-old was found alone up on the roof of the apartment building. When questioned about William he stated that a "boogey man" had taken the child. Later that day in Brooklyn, a streetcar motorman, Joseph Meehan, noticed an elderly man attempting to pacify a small boy. The boy, who did not have a coat or hat on although the weather was cold, was crying and saying he wanted to go home and see his mother. Meehan later identified the child as William. He has never been heard from again. Investigators originally doubted the three-year-old's story and thought William had simply wandered off. They searched neighborhood factory buildings and local canals without result, and concluded that the child had in fact been abducted. The three-year-old described the "boogey man" as a slender, elderly man with gray hair and a gray mustache. William's case was highly publicized but remained a mystery until 1934, when Albert Hamilton Fish was arrested. A photograph of Fish is posted with this case summary. He was charged with the murder of ten-year-old Grace Budd, who was abducted in 1928; he was caught after writing a letter to Budd's mother in which he described how he had killed her daughter. Fish lead investigators to Budd's body after he was apprehended. 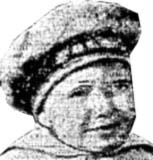 During his trial, Meehan identified him as the man he saw with William the night the child disappeared. Fish confessed to William's murder, Budd's, and the slayings of several other children. He pleaded insanity at the Budd trial, but was convicted and sentenced to death. He was not charged in any other cases. William's case was considered closed after Meehan's identification and Fish's confession. It is no longer being investigated by law enforcement. His remains have never been found, however. Updated 3 times since October 12, 2004. Last updated March 16, 2012; picture added, name and distinguishing characteristics updated.